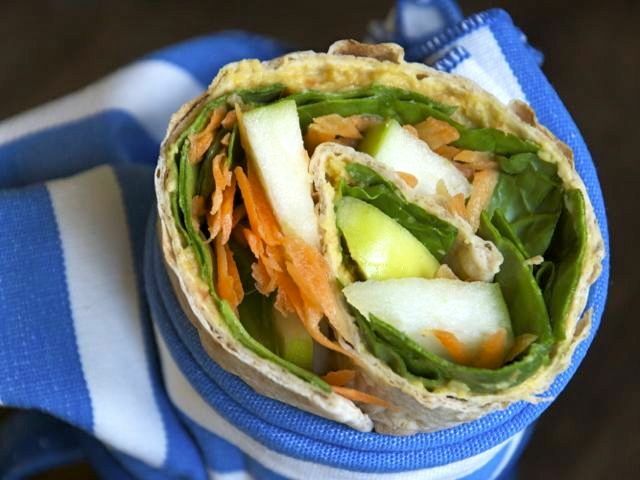 Roll-up sandwiches, also called wraps in some circles, make a great brown-bag or picnic lunch because they can be made ahead of time and hold up well. This recipe is an adaption from one in Everyday Food; for other roll-up variations, check out Smoked Turkey and Roasted Red Pepper Roll-ups and Roll-ups with Spinach, Feta, and Olives. To prepare the lavash, barely dampen a dish towel or several paper towels, and layer the lavash between layers of towels. Set aside. In a small bowl, toss the carrots with half the lemon juice, then season to taste with salt and pepper. Toss the apple slices with the rest of the lemon juice. To prepare each roll-up, lay flat one of the lavash breads and spread it with ¼ cup hummus, leaving clear a half-inch border. Place a quarter of the arugula or spinach leaves on the hummus, then layer ¼ cup carrots, and finish with a fourth of the sliced apples. Starting on one side, roll up the sandwich like a burrito, tucking in ingredients if necessary while you roll. Once the sandwich is rolled up, trim off the ends (if you like) and cut the whole roll into halves (or thirds). Repeat with remaining lavash and ingredients. Serve or package for later, tightly wrapping each sandwich in plastic wrap. Look for lavash bread in the bread section of your grocery store, or at Trader Joe’s. Flour tortillas can be substituted, but they make for a chewier texture.